Last Friday, September 26th, was Johnny Appleseed Day. 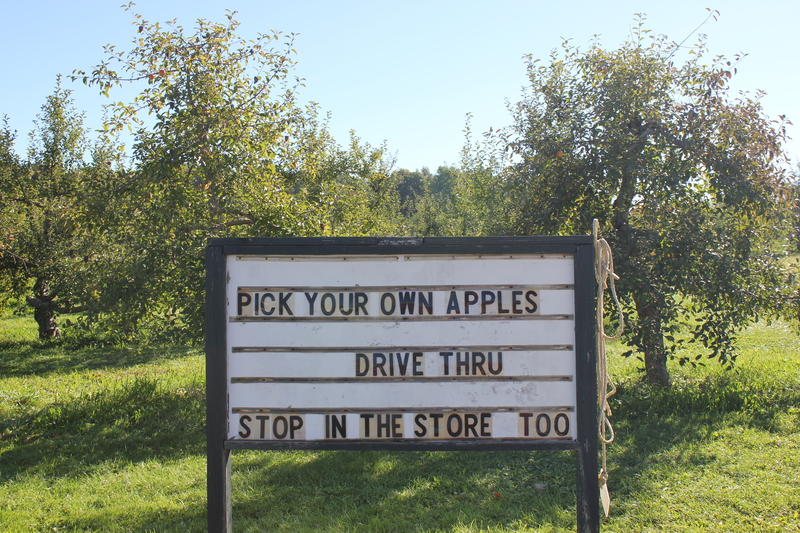 Coincidentally, it also happened to be the day we decided to make our first trip of the season to our favorite apple orchard, Eddy Fruit Farm in Chesterland, Ohio. Apples are one fruit that my husband does not bring home to me from his market because he cannot sell a box of apples that has ten missing. I’m quite happy to buy them actually, especially when I get to pick and eat gorgeous ripe fruit straight from the tree, with help from my babies, the apples of my eye. Eddy Fruit Farm has been run by generations of devoted family members since way back in 1869. That’s not too long after John Chapman, AKA Johnny Appleseed, was making his way through Ohio and the midwest in the late 1790s and early 1800s planting apple trees along the way. 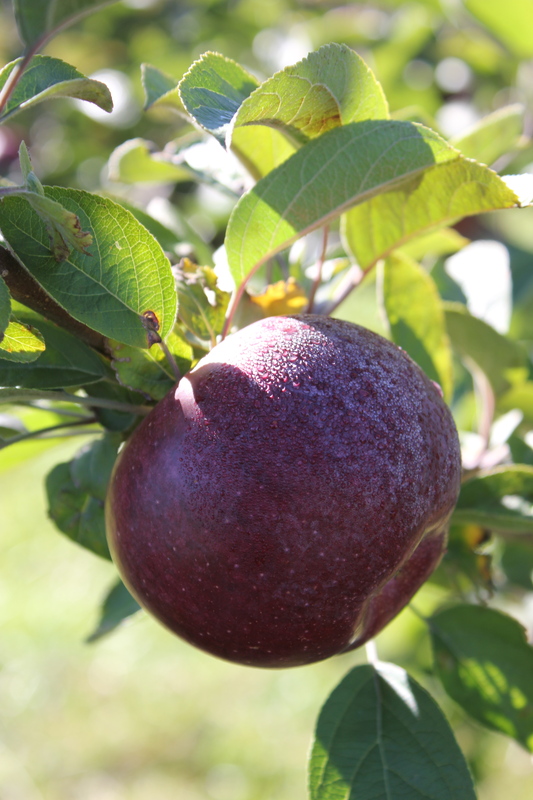 The Eddy farm now grows thirty-five different varieties of apples, as well as pears, peaches, plums and grapes. My family was excited to pick apples at the Eddy farm on that idyllic fall morning. We arrived early and made our way up the gravel road where we were greeted by farmer Tom who asked what we were hoping to find. I told him a crisp, sweet apple for eating and baking. He nodded with a grin as if every other picker says the same thing. “Are you up for an adventure?,” he asked. “Definitely!,” I replied. “It’s a bit of a walk, but if you follow that path there, it will take you to the Macoun apples,” he told us. “They are just starting and they have low fruit that will be easy for the kids to pick. You’ll be the first to pick those trees.” I hadn’t heard of Macoun apples before, but I trusted his expertise. I asked him if he was familiar with my husband’s wholesale produce business as I knew the Eddy family bought some vegetables there to sell in their store. He told me his brother manages all of that while he stays in the fields, doing the hard work. We chuckled and shook hands goodbye. The kids and I trudged through the tall grass and soon discovered the apples he had mentioned. Indeed, we were the first early birds there picking. The trees were filled with large ripe fruit. Morning dew was still glistening on the apples in the sunlight. We had visited this farm with the girls’ preschool classes in years past when farmer Bart, taught us to twist while pulling the fruit from the tree. The girls knew just what to do and got right to work. 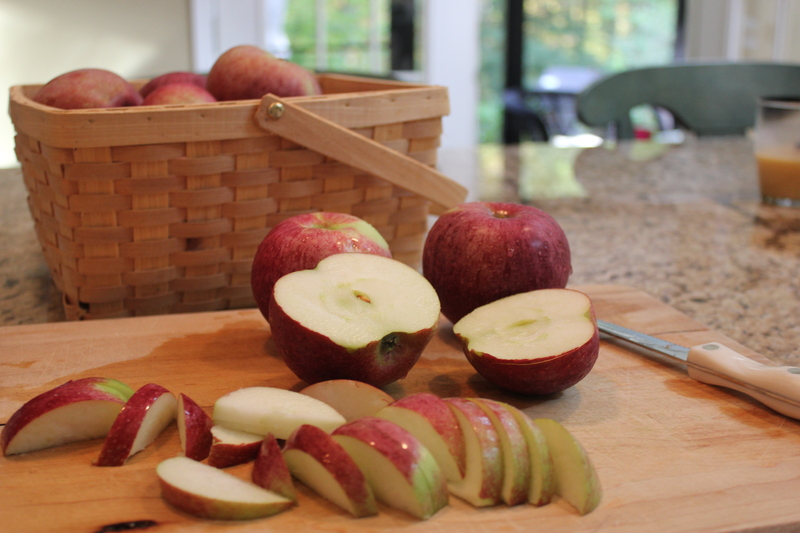 We quickly filled our basket with gorgeous fresh apples. Since farmer Bart always let the kids choose one apple to eat in the orchard, I figured he wouldn’t mind if I let the kids do the same. It didn’t take much convincing. In fact, John hadn’t been waiting for my approval. He had already devoured his first piece of fruit, thrown it to the ground and was reaching for another out of the basket. Looking around at other apples that had fallen from the trees, I figured no harm done. My Johnny Appleseed was really just helping to grow more apple trees. The Macouns were a great recommendation. Crisp and sweet with a touch of tartness. Perfect for both eating or baking. The kids were quiet as we all enjoyed a healthy morning snack, as fresh as they come, straight off the tree. Our basket was full and so were the kids’ bellies, so we decided to make our way back toward the farm store to pay for our fruit and have a look around. Before heading home, we stopped to make a wish, discover a ladybug and greet a new furry friend along the way. Later on, when I learned that it had been Johnny Appleseed Day, I decided we should find out more about him. My little John and I picked up a few books at our next visit to the library. He was in fact a real person. His name was John Chapman and he was born on September 26, 1774 in a small town in Massachusetts. He was the son of an apple farmer who fought in the American Revolution and had a sister named Elizabeth (as does our John ironically). At the age of 23 he decided to travel west to plant apple seeds in Pennsylvania, Ohio and Indiana. He even owned land in those states and established nurseries there. Apples were one of the few crops that could be grown and harvested easily and eaten in one form or another all year round in the wilderness settlements of early America. While he did not establish all of the original apple orchards in America, he did play an important part in bringing apples to the frontier. Johnny Appleseed was a good natured man, filled with kindness and humanity, had an independent spirit and was a generous friend to all, especially animals. Like my John, he apparently mostly walked bare foot. He died in Fort Wayne, Indiana in March 1845, but his story, like the apple seeds he planted, live on. 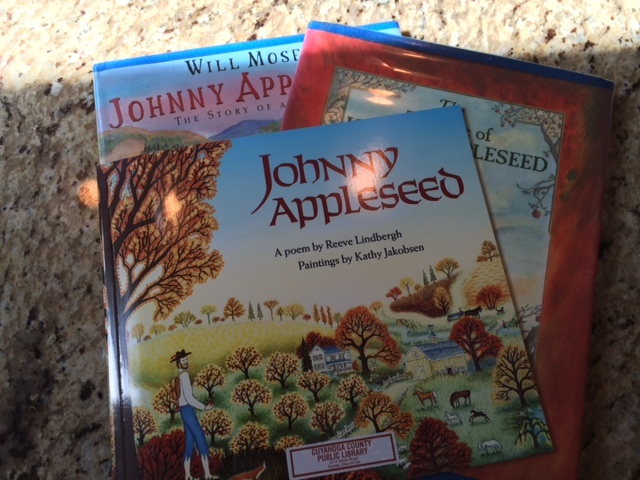 Today as I read to my children about Johnny Appleseed, his good character set a great example of the kind of person we should all strive to be. 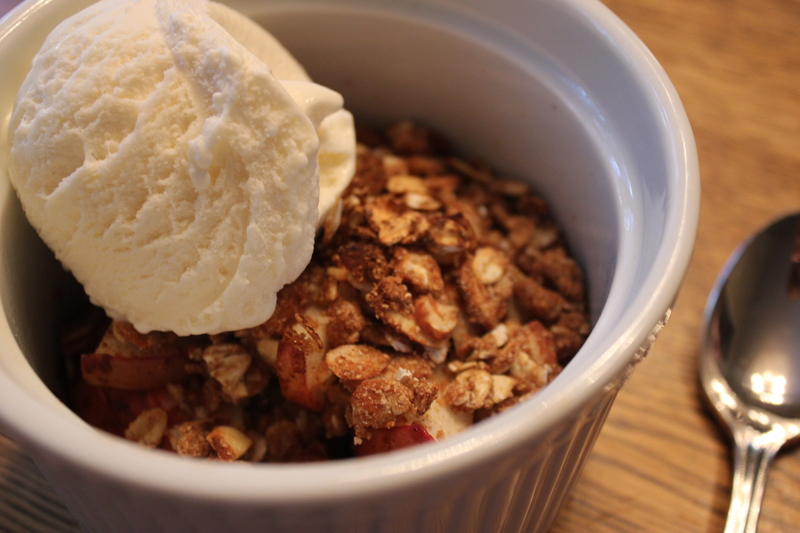 With a new appreciation for our beloved apples and the man who helped bring them to us, the kids and I used our fresh fruit from the farm to prepare one of our favorite apple desserts, apple crisp! 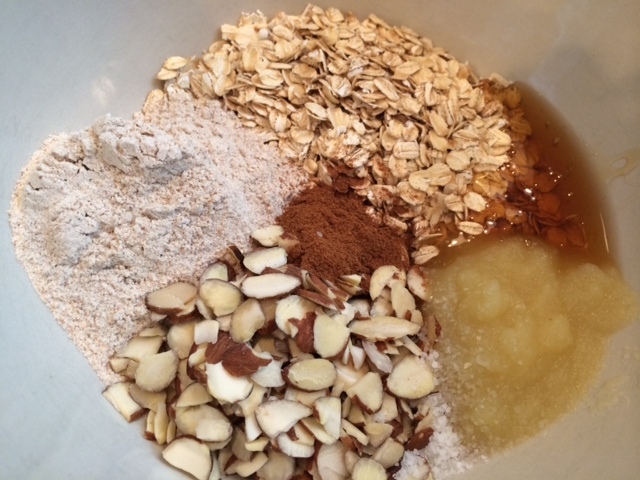 I’ve created a recipe that is healthier than most traditional apple crisp recipes. It includes honey instead of sugar and I also used applesauce in place of butter, to cut out even more fat and calories. I’m happy to share it with you. Preheat oven to 375. Cut apples into thin slices or bite sized chunks. Mix with lemon juice, cinnamon and honey. Spray six ramekins or one pie plate with non-stick spray. Divide apples into baking dishes. In a separate bowl combine crumble topping ingredients. 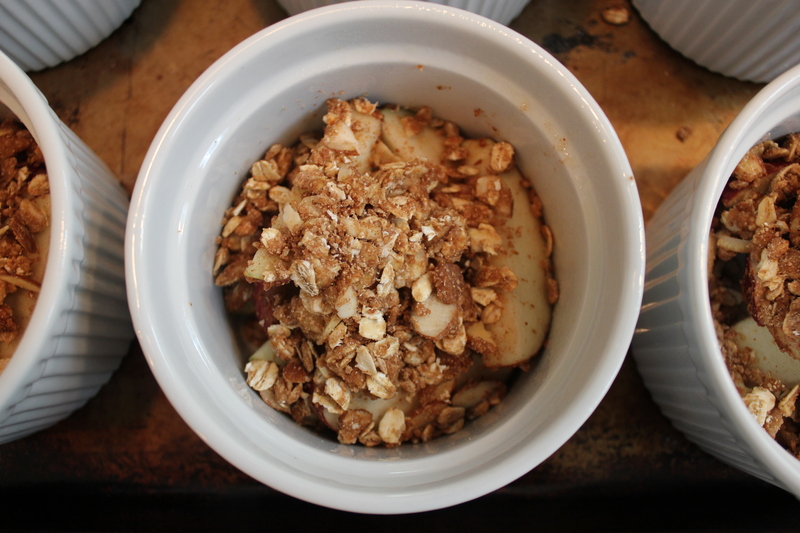 Divide crumble evenly over apples. Place ramekins on baking sheet. If the tops appear to be browning too quickly, cover with foil. Bake for 30 minutes. Cool slightly. Top with vanilla ice cream for an extra special treat. Serves 6. We are so thankful for delicious, healthy apples. Here is a little blessing you may know as well, in honor of Johnny Appleseed; the original and my own. Oh, the Lord is good to me, and so I thank Him for giving me the things I need. The sun, and the rain, and the apple seed. The Lord is good to me. Now that fall has officially arrived, I am craving comfort food. 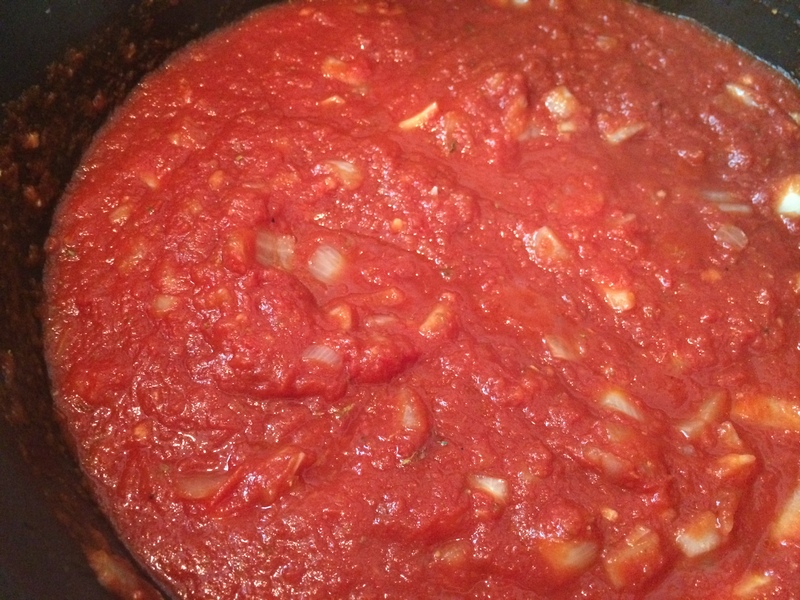 This week I prepared my Italian great grandmother’s meatballs and marinara sauce. I brought some to my close friend and her family who just welcomed their third precious baby girl. I remember how tough it was to get dinner on the table with a newborn in my arms. Some of my good friends delivered meals to me after I had John, and I was so grateful. Now I’m paying it forward. I put my own spin on Mama Carter’s meatballs to make them healthier, substituting turkey for the traditional beef. I doubled the recipe so that I would have dinner ready for my own family too! You could also freeze half to use later on. It comes together quicker than you might think and makes for a special homemade meal that is healthy and fresh. Here’s my recipe! Combine all ingredients in a large bowl. It works best to get your hands in there and mush it all together. As a former vegetarian, this part is a little hard for me. Prepare a large skillet by spraying with non-stick spray and drizzle with a little EVOO. 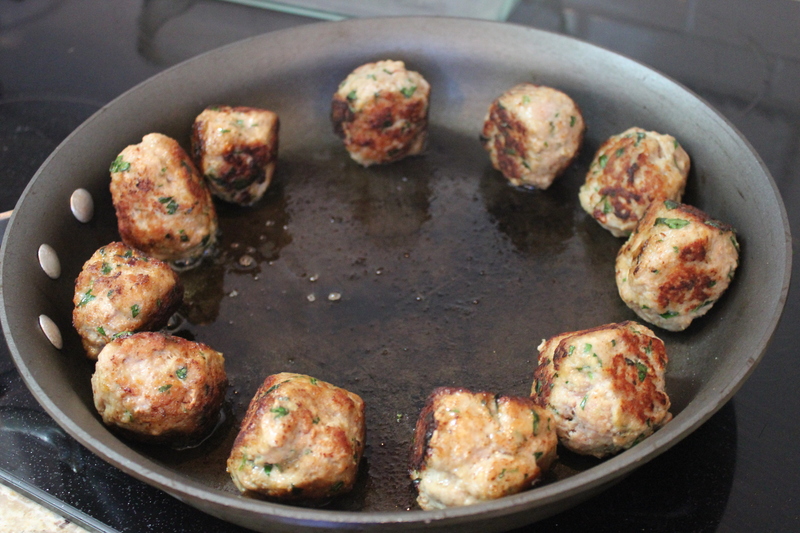 Form meatballs. I like to make them no bigger than a cherry tomato. Otherwise they brown too much on the outside before they cook through. Brown the meatballs on all sides until cooked through. To brown all sides I lean them up around the outside of the skillet. 1 can crushed tomatoes, 29 oz. Heat oil in warm skillet, add onion and garlic. Saute until fragrant. Add other ingredients. Simmer 25 to 30 minutes. Mix in cooked meatballs. Serve with your favorite pasta. I use whole wheat penne or fettucine. 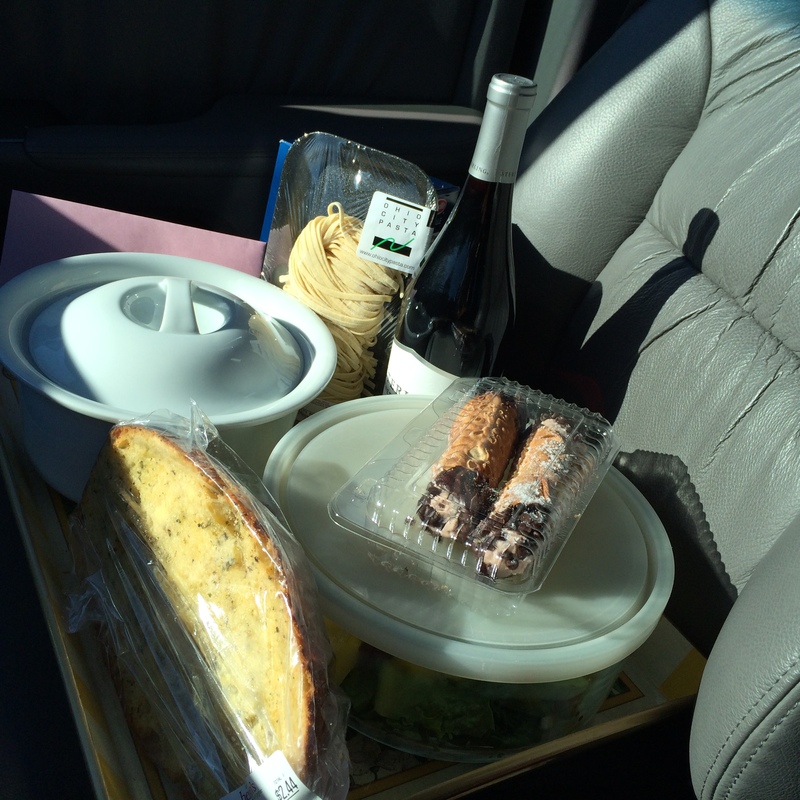 I picked up some locally made pasta, garlic bread, cannoli and wine to deliver along with the salad I made, the meatballs and sauce. I know she can’t drink much yet because she is nursing, but she deserves a nice tall glass or two to celebrate all her hard work. It was so wonderful to see my dear friend and to meet the newest addition to her beautiful family. I am a self-professed “bird nerd.” My feeder is strategically placed so that I can see it out of every window in the front of our house. It is most visible from our kitchen table, but I can also see it clearly from our screened-in porch, the front hall, our living room and my oldest daughter’s room. My love of birds is obvious even when not looking out the windows. I have several framed antique Audubon bird prints hanging on my walls, pillows made with bird print fabric, bird figurines and even bird salt and pepper shakers. You’d think I was some crazy old woman hoarding all things bird. Maybe I am. 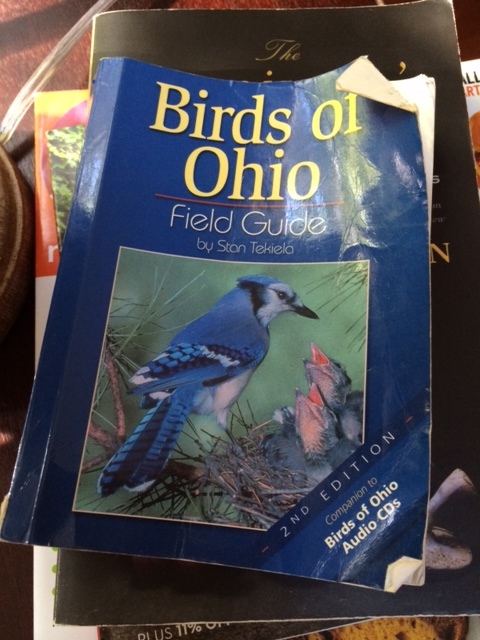 So it’s lucky for me that we live across the street from the South Chagrin Reservation of the Cleveland Metroparks which happens to be a site within the Cleveland Area Loop of the Lake Erie Birding Trail. 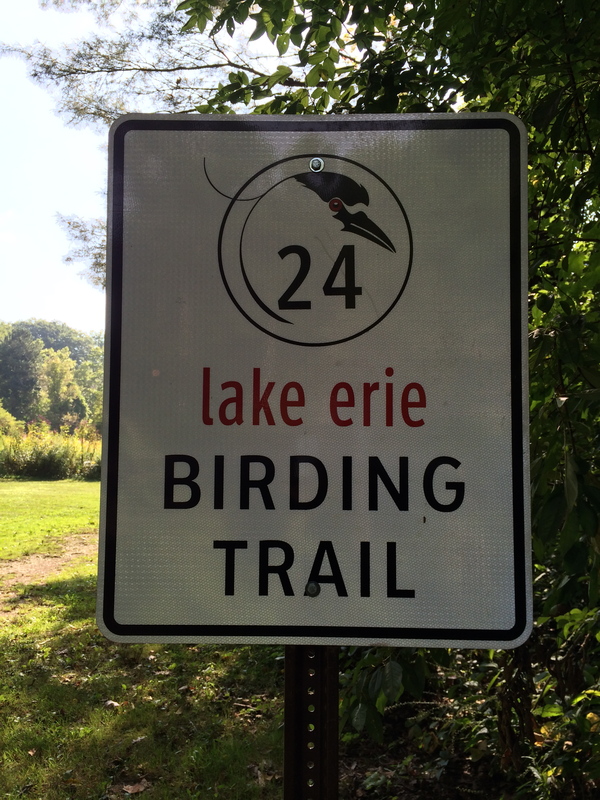 Designated by the Ohio Department of Natural Resources and the Division of Wildlife, the Lake Erie Birding Trail is divided into seven loops. The sites in each loop have been identified as containing collectively nearly 400 bird species. There are more sites on the Cleveland Area Loop, 28, than any other loop and some of them are among the most famous birding hotspots in the Midwest. The total species list for the Cleveland loop is 356, and a remarkable 12 of those species have only been recorded in this region. Tremendous numbers and diversity of migrant songbirds fill lakeside woodlands in spring and fall. Waterbirds galore pack marshes and the open lake waters, and interesting marsh birds breed in coastal wetlands. Winter brings hardy northern ducks, gulls, and raptors. There is never a dull season. And it’s all happening right in my front yard. It’s a great place to be a bird nerd. We see a large variety of birds just outside our window including common ones like Cardinals, Blue Jays, Robins, Chickadees, Goldfinches, Tufted Titmouses, and Nuthatches. But we are frequently visited by many other species such as Red-winged Blackbirds, Grosbeaks, Purple Finches, Eastern Bluebirds, various woodpeckers including the rare Pileated, hawks, owls, hummingbirds, and many more. The kids have learned most of the bird’s names. What fun it is to eat our breakfast while we watch the birds eat theirs. On occasion, we’ve even seen a hawk swoop down for a chipmunk. Not so appetizing. 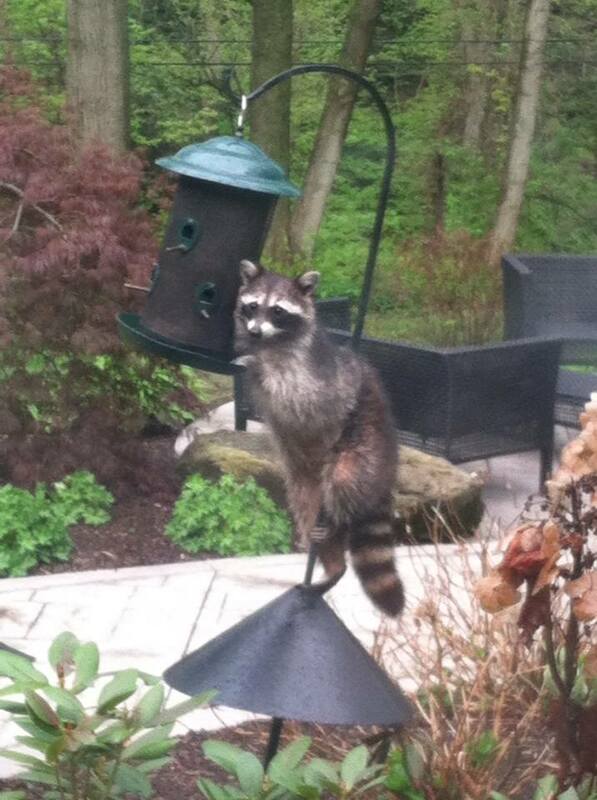 Last spring I was forced to take my feeder down after my raccoon friend was causing some mischief. Every morning before dawn and after dusk he would maneuver his way around the baffle, stand on it and shovel all the food out of it right into his mouth, like a little kid stealing cookies out of a cookie jar. Occasionally, he would even figure out a way to pull it down and dump out all of the seed. Once or twice I found the feeder in various parts of the yard as if he tried to drag it back home. So, I began bringing the feeder in at night which worked until I kept forgetting and then he pulled it down and eventually he broke it. During the day, we’d watch the squirrels do acrobatics swinging from nearby bushes and even jumping from the roof onto the feeder. I tried lots of tricks including cayenne pepper in the seed, which the squirrels hate but doesn’t bother the birds. Against my better judgement, I even put Crisco on the baffle. It was a little bit funny to watch, but it still didn’t work. So, I took the feeder down until I could find a squirrel proof one. Fast forward four whole months. John and I finally made a stop last week at one of our favorite local garden and pet supply stores where we visited Gator the dog and selected a new feeder. 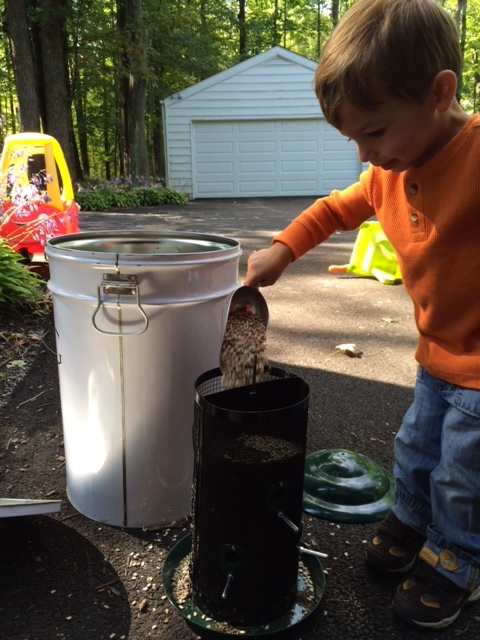 He helped me fill it up with seed and hang it back in our special spot. It took a day or two, but before long our new feeder and the whole yard was buzzing, or chirping, with activity! I was so happy to see all my feathered friends! This week as we’ve watched the birds come and go, we’ve noticed an abundance of Goldfinches. “The yellow ones are hogging all the food!,” the kids laughed. And they were right! At times there were as many as ten finches on the feeder and at least twenty more waiting for their turn in the trees and even on the roof. Some would fight others off or scare them away. As we watched them closely we also began to notice that some of the birds in the tree were flapping their wings quickly with excitement and chirping repeatedly. Then we actually saw another bird turn her head to the side and then appear to touch beaks with the other bird. I had seen similar behavior when a Cardinal happened to lay eggs in a nest outside our dining room window one year, so it was familiar to me. Were we seeing a mother bird feeding her babies in the tree? We thought birds normally laid their eggs in the spring. It seemed late in the summer for baby birds. We were interested to know more, so my little nature detectives and I went to work on the case. After some research, it turns out, we were exactly right! We learned that American Goldfinches breed later than most North American birds. They wait to nest until late summer when milkweed, thistle and other plants have produced their seeds which goldfinches incorporate into their nests and also feed their young. Their parents feed them seeds which have been partly digested and regurgitated into their mouths. By the time they are 10 to 16 days old they are ready to leave the nest. The parents continue to supplement them with food until they learn to fly strongly and until they are able to self-feed. 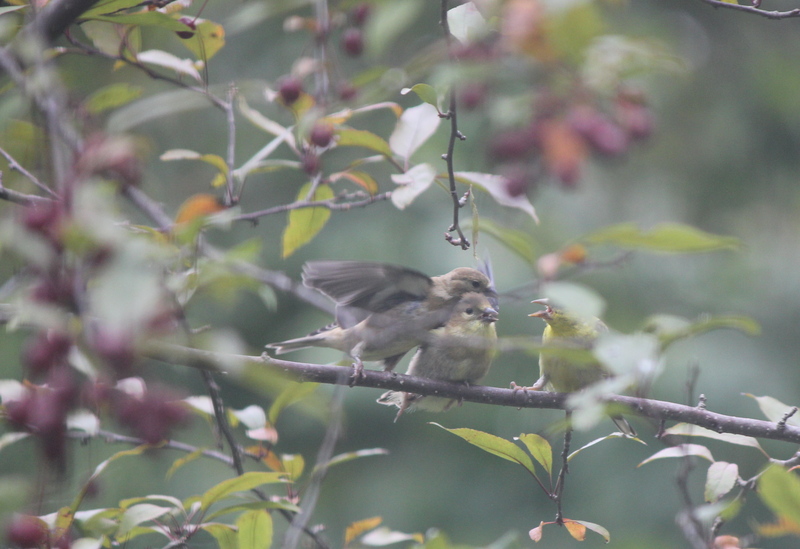 So, likely the juvenile Goldfinches we were watching in the tree outside our window being fed by their mother were just a few weeks old. My timing was impeccable! I didn’t plan it, but I happened to put my new feeder out at just the perfect time to help this and other mother finches gather seeds and thistle to feed their young baby birds. And here she was right out our door in our beautiful Serviceberry tree feeding her babies, nurturing them, teaching them to fly and feed on their own, getting them ready to flee the nest and go out into the world. I couldn’t help but notice the similarity between that momma bird’s situation and this momma bird, moi, sending my own babies out in the world just a few weeks ago; the girls to first grade and kindergarten and John to his first year of preschool. As I sat and watched this mother bird go back and forth, back and forth to the feeder and then to one of her babies flapping their wings to repeatedly regurgitate her food again and again, I was in awe. “Wow, what a selfless act!,” I thought. That bird was working so hard to feed her babies. She must have been so hungry from all that hard work! And here she was giving her babies all her own food. Not to mention, throwing up to do it, usually not such a pleasant experience. And, she’s probably spent her whole day doing it. I could relate because I feel like I spend my whole day feeding people in my house, breakfast, snacks, lunch, more snacks, dinner, then dessert. Someone is always squawking for food or flapping their arms in need of help here too. And it never fails that when I finally get to sit down and eat my own food, someone asks for seconds, so I give them what’s on my own plate so I don’t have to get up yet again. Now, I consider myself a decent mom, but I’m not sure I could or would throw-up to feed my own babies. And what if she wants to go fly away and chat with her girlfriends at the feeder down the street or what if she wants to go take a nap in her nest? Nope! She’s busy throwing up for her babies, ALL DAY LONG. This was one amazing momma bird. She deserves a break! But, then I realized something. Before long at all those birdies will leave her nest to fly away and explore the world. She will have done her job nurturing them to grow big and strong, teaching them to feed themselves and showing them how to fly. Soon she will have her time to do as she likes. She will be a solitary bird with quiet days and an empty nest. Until next summer, at least. Maybe it sounds silly, but I really admire that bird. I am inspired by her complete lack of selfishness and her tireless effort. She’s helped me to remember that in a few very short years the last of my little babies will leave the nest when he heads off to kindergarten too. And then not too long after that, all three will fly away to college and then flit off into the real world. That mother bird has reminded me that while these early years are crazy busy, they don’t last forever. Before long my baby birds won’t want to be cuddled in our little nest. I’m reminded to focus fully on the most important present task at hand and keep my nose to the grindstone, nurturing my baby birdies while I have them here in my nest, flapping their wings for my attention, singing their happy songs, learning how to fly. I want to do that wholeheartedly, with complete selflessness, just like that momma bird. After explaining to my children what the mother bird was doing for the baby birds, I’d like to hope that they might admire that mother bird’s generosity the same way I have come to. That they will remember her actions and perhaps act the same way when given the opportunity. But, that’s probably wishful thinking. Most of all, I hope I’ve taught them to look up, look out the window, go outside, listen to the bird’s song, watch for and learn from the miracles of nature surrounding them, and to preserve and protect the Earth so that they may also sit in awe of nature with their own babies one day. Here in Ohio the temperatures are quickly falling and so are the acorns, lots of them! The kids and I have been having fun collecting them. We have buckets full! The girls have also been asking a lot of questions about them. I discovered that I didn’t have all the answers, so I did a little bit of homework. It turns out those tiny acorns, that in seasons past I have cursed as I raked them up or when one knocked me in the noggin, are quite amazing little nuggets of nature that also happen to teach us something about ourselves too. In case you were unsure, acorns grow on oak trees. They sprout from stems on the tree and can grow alone or in clusters. They consist of a green or brown nut that contains one seed and is topped with a cap or “cupule” that makes them look like they are wearing little hats. Based on our research we discovered the oak trees on our property are Red Oaks. 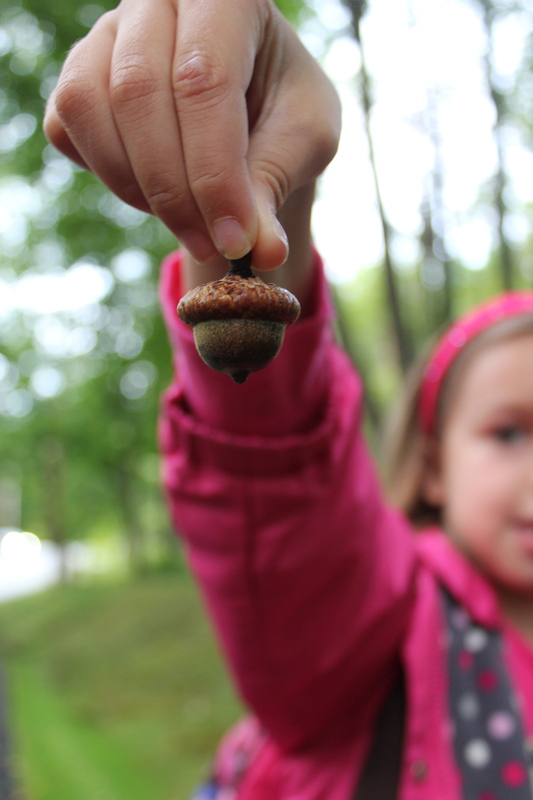 The acorn is a vital part of the ecosystem. 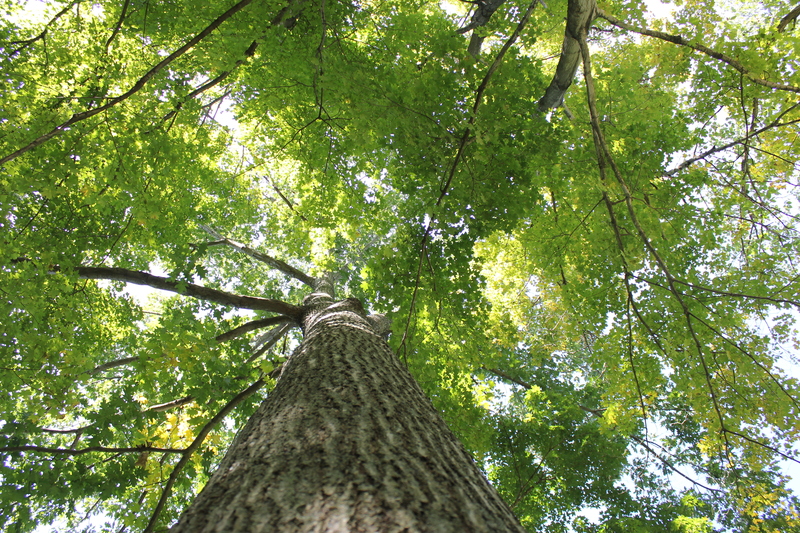 Not only do the seeds propagate new oak tree growth, they are also a major food source for birds, rodents, and larger mammals, such as deer and bears. What I find especially fascinating about acorns is that they must rely on methods other than wind to move them away from their parent oak tree due to their weight. In order to germinate successfully, the soil must give them access to water, sunlight, and nutrients. In addition, they must be planted at least 65 feet from the parent tree to have adequate room for growth. That’s pretty far! To accommodate this, oak trees have developed a mutual relationship with acorn eating animals. These animals harvest the seeds, move them away from the tree and bury them for storage, allowing some to germinate, while others are eaten. An acorn requires about eight months to germinate from seed to sapling. Watch this beautiful time-lapse movie that shows an acorn transforming into an oak tree. So, what to do with the dozens of acorns we’ve collected? Well, the girls wanted to paint them bright rainbow colors. I had some other ideas in mind. So, we did both! Just make sure you wash them first and then bake them at 325 degrees for at least 30 minutes to get rid of any bugs or moisture so they don’t get moldy. We created some seasonal decor by hot-gluing some acorns and some caps to picture frames we had around the house. It was a fun way to bring the outdoors in for fall. Coincidentally, I have also been meaning to clear some brush out of an area near our driveway that is mostly full of tiny oak trees. After gaining such an appreciation for the miracle of an acorn growing into a tree, I felt bad cutting down these babies. But, I also now knew that they were too close to the larger oaks and didn’t have adequate room for growth. I don’t want this entire area to fill in with brush, so I spent an afternoon last weekend clearing some away. To make up for the baby trees I killed, the kids and I decided we wanted to plant some of the acorns we had collected to watch them grow into trees. After doing some research, I learned that in order to grow a new red oak, acorns must be planted in the second season – the following spring. To do this, you are to put acorns in a Ziploc bag with damp peat mix or sawdust. Close the bag loosely and store in the refrigerator. Check the acorns throughout the winter and keep them just barely damp. Planting these acorns in late April of the following season apparently gives you the best success but can be planted later. We don’t really need any more trees on our property, nor do I have room in my fridge for acorns, so we decided to plant one acorn this year just for fun to see if anything would happen. As we watch the squirrels and chipmunks from our window busy at work collecting their nuts and storing them away for winter, the children and I have a new appreciation for the amazing acorn and for each of God’s gorgeous creations. Every plant and animal was placed here by him to play some important role. We all contribute something to this Earth in the short time we are here and we are all connected whether we realize it or not. The oak tree that grows the fruit, the acorn that feeds the animals, the squirrel that spreads the seed to grow new trees, more food, more oxygen and more seeds. As I gaze out at those beautiful oak trees on our little piece of the planet, today I can’t help but feel as though God is our oak tree, and we are all his acorns, his fruit, spreading his love in all different directions. Last year my Aunt Gail made me a very special gift. She copied all of her mother’s and her sister’s hand written recipes and put them together for me and my sister in a cookbook. My Grandma Carter was known to be a great cook. My Grandpa was Italian so many of the recipes I received are dishes I’m guessing she learned to make from his family including cannolis, manicotti, meat balls, marinara sauce and much more. I am so grateful to have her family recipes to share with my own family. Cancer took my Grandma’s life way too soon. All of my memories of her are from my childhood. I recall eating holiday meals with my sister and my cousin at the kids table in her home in suburban Chicago. I remember summer visits where we played in my grandparent’s yard, ate peaches and apples from the trees on their property and picked tomatoes from their garden. Often I think about how I see some of my Grandma in myself. I feel honored to possess some of her qualities. She was a hardworking woman who loved to cook and garden. She was also an accomplished fisher(wo)man. My nephew Ethan has a huge fish she caught hanging in his room. If there was work to be done, Grandma didn’t wait around for help. She was right there doing it herself. I wish I could have had her in my life much longer. 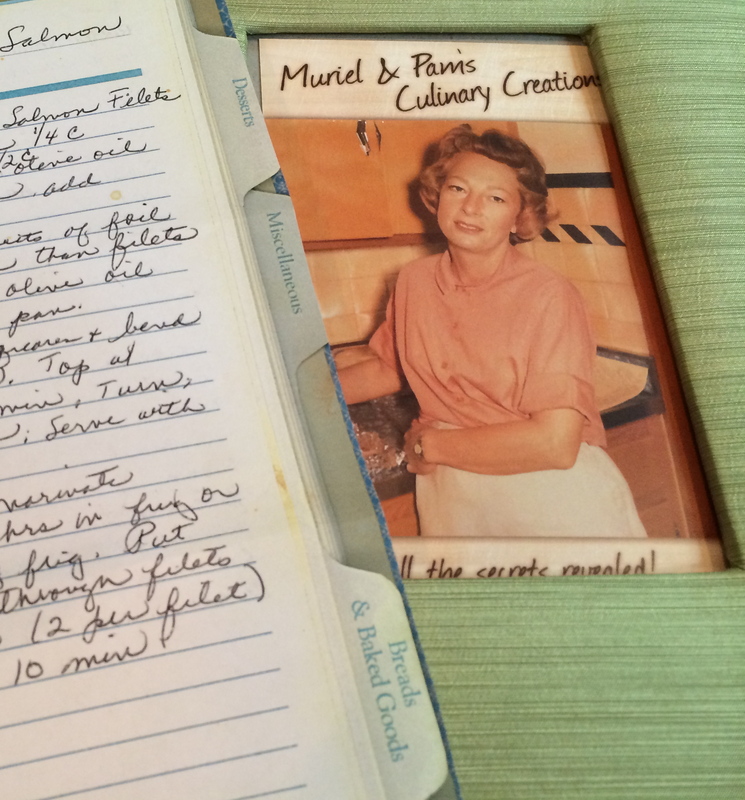 I like to think I am keeping her memory alive by making her recipes for my own family and by sharing them with you. Here’s my version of one of my favorites from her cookbook. I’ve tweaked it a bit to make it a little lighter. It is a low calorie, high protein meal and, of course, salmon is full of healthy omega-3 fats that may help reduce the risk of heart attacks and stroke. My kids love salmon, (Elizabeth says it is her favorite food), so this meal has become a stand-by for us. 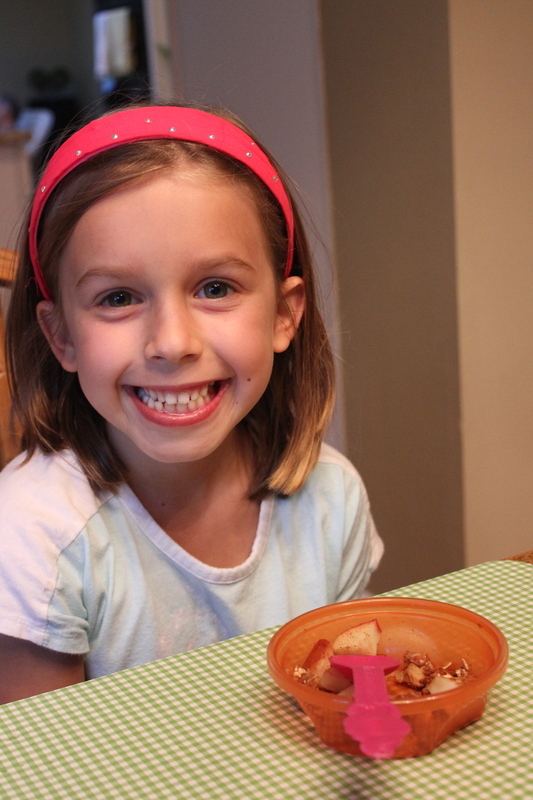 It’s healthy and very quick to put together on a busy evening after school and activities. Turn on broiler on your oven. Spray casserole dish or rimmed baking sheet with non-stick spray or brush with a little olive oil. Place salmon filets in casserole dish. Here’s a tip I’ve learned to save time. If you buy salmon in a big slab rather than individually portioned filets, a quick and easy way to cut the salmon is to use your kitchen shears. They go right through the skin every time. 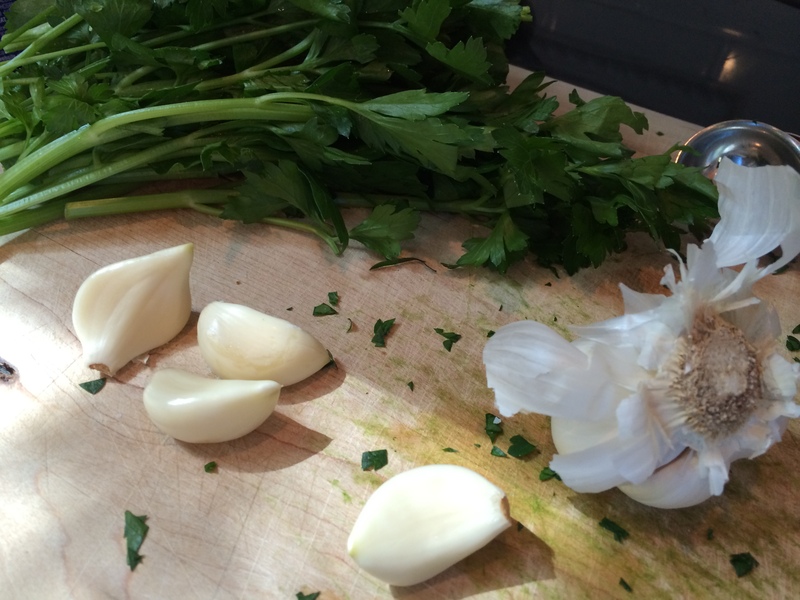 In a small bowl combine olive oil, lemon juice, zest, minced garlic, seasoning or herbs, salt and pepper. Stir well and pour over salmon filets. Place in oven on middle rack. Broil for 15 or 20 minutes. We like our salmon well done. I take it out of the oven when the top of the salmon looks brown and crispy. I usually serve fish with brown rice and a salad or green vegetable. This week I happened to have picked up some gorgeous heirloom tomatoes from the farm market in town along with some handmade Ohio City fettucine. Normally I buy whole wheat pasta, but he only had black pepper, so we gave that a try. 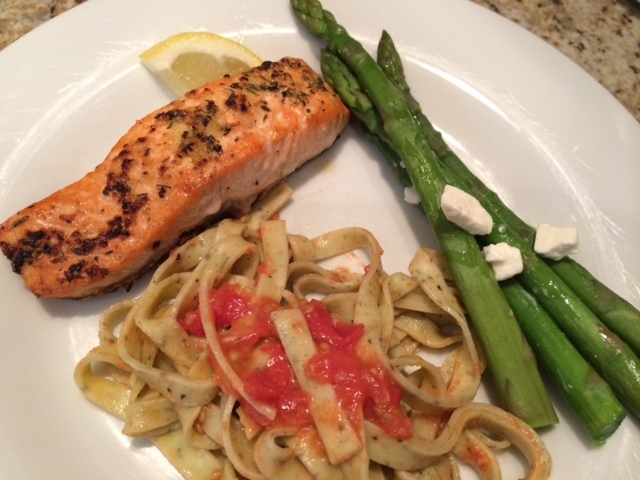 I was excited to eat them both and pasta seemed to go well with Sicilian Salmon, so it was a perfect side dish for this meal. Andy brought home some pretty asparagus from his market, so I decided to use that up too. To prepare the pasta I just chopped two or three tomatoes and put them in a skillet with a tablespoon of olive oil, a clove of minced garlic and a little salt and pepper. The fresh pasta only takes two minutes to cook. I tossed it with the fresh tomato sauce. I cut off the ends of the asparagus, then simmer it in a little bit of water and usually give it a little drizzle of olive oil and sprinkle of feta. Here are the nutrition facts for 1 serving of Sicilian Salmon (not including the asparagus and pasta) according to My Fitness Pal. Since I posted the workout I do “When All Else Fails,” I’ve been asked about my exercise routine on a good week and how I fit it all in. So, it seemed like a good time for me to share it with you. These are the workouts I did to help me lose 35 pounds of baby weight after the birth of my third child plus an extra 15 pounds that had been lingering from my other two pregnancies. We are all busy and I know I can use all the help I can get in my life. 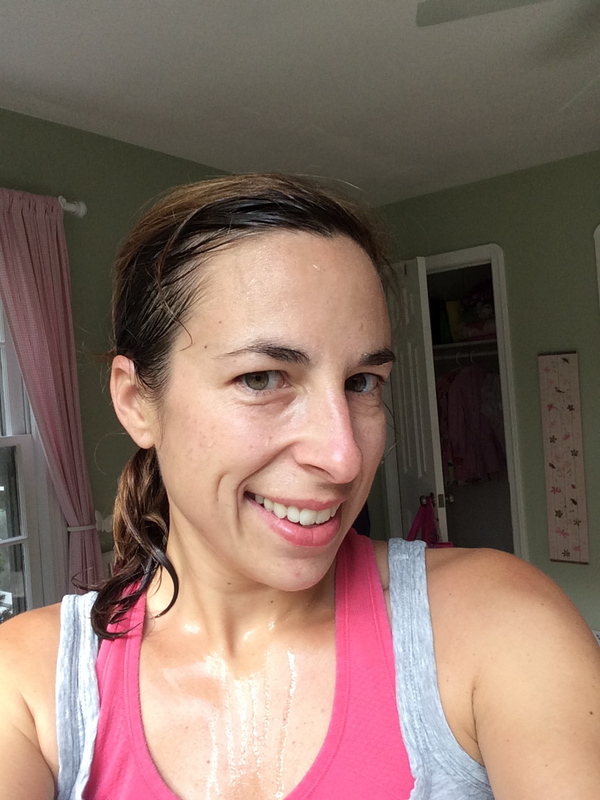 So, if my routine inspires another busy mommy to find time for herself, I am glad to help. That’s why I started this blog to begin with! Resist the temptation to feel guilty you are not spending this time doing chores or playing with your kids. The reality is it is only 30 minutes or an hour that you are taking for yourself. You will spend the rest of the day doing things for other people. The laundry, the dishes, all of it can wait. Making time to make yourself happy, will in turn make everyone in your household happy. It will also teach your children a valid lesson, that your needs are important and the world does not always revolve around them. Here is the schedule I was hoping to follow last week before all three of my kids got sick and our new “back to school” routine fell apart. When the stars align and I can manage to find the time, I try my very best to follow this schedule. I don’t want to jinx myself (I actually have a sore throat as I write this), but let’s pretend for just a few minutes that this coming week goes as planned and I can get back in this routine. If these days don’t align with your schedule or you don’t have an elliptical machine, it’s no big deal. Just modify it to meet your needs. Swap in a walk or other cardio exercise of your choice. Cardio: Elliptical – 30 to 40 minutes. Click here for my 30 minute, 400 calorie burn routine. Strength Training: Shoulders, Chest, Back. Click here for my routine. How I fit it in: I try to get up at 5:00 am, before the kids are awake. My early bird, Elizabeth, sometimes sits in my room and watches cartoons while I finish. I can usually do all my cardio then I stop to get the girls ready for the day and on the bus. I do my strength training while John plays or watches cartoons for 15 minutes. Or, I come back and do this later while he’s napping. This way I can have the morning free with John. We’ve started going to story time at the library on Mondays. Cardio: Run – 4 to 5 miles/30 to 40 minutes. Strength Training: Abs. Click here for my routine. 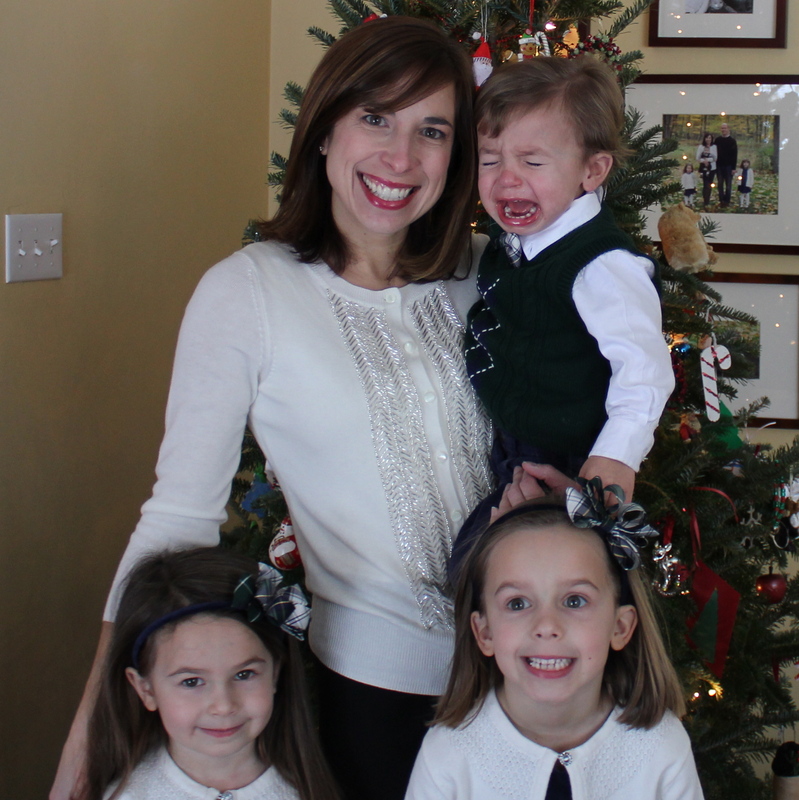 How I fit it in: John goes to preschool Tuesday mornings and the girls are at school. I do my run as soon as I drop him off for school so that I don’t run out of time later. Then I come home and do a quick ten minutes of abs before moving on to some chores. Cardio: Cross Train for 30 minutes (walk, do a work-out video, or do “When All Else Fails” Workout) or REST if you are feeling sore and need a break. Strength Training: Leg Routine or REST. How I fit it in: If it’s nice, I take John for a walk. If we have an errand to do or a fun activity planned, I do a video before he’s up or I do “When All Else Fails” when he naps in the afternoon. Often, I use Wednesdays to rest and focus on chores and being with my kids. How I fit it in: John goes to preschool Thursday mornings too. I do my run as soon as I drop him off then I come home and do a quick ten minute of abs before moving on to some chores. Cardio: Elliptical – 30 to 40 minutes. Repeat routine from Monday. Strength Training: Biceps, Triceps. Click here for my routine. How I fit it in: John has swimming lessons Friday mornings, so I try to fit in my elliptical before he’s up or during his nap. How I fit it in: Andy has Saturdays off… his only day. He leaves for work at 3:30 am the other days of the week so Saturday is the one day I can get up early and sneak away for an early run. Most of the time though I let him catch up on sleep. With soccer and dance class on Saturday mornings, this time of year we have to do our long runs on Saturday afternoons. Sunday afternoons are our fall back if we can’t fit in our long runs on Saturdays. Andy is training for the New York Marathon so we take turns. 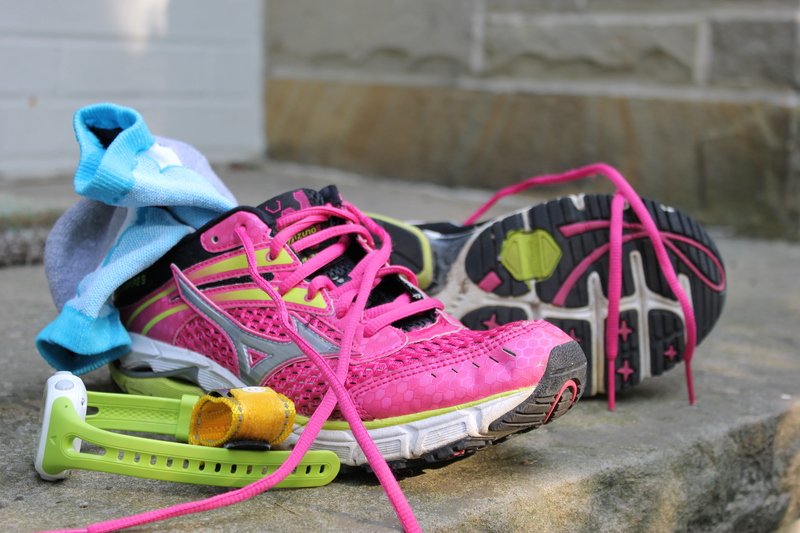 Here are some other general tips on how to fit in a workout with a busy schedule and a house full of craziness. Plan to work out EVERY day. It frequently won’t happen, but put it on your calendar or at least your mental to do list. Something is bound to come up at least a few or half of those days. Even if that is the case, you will still have fit in a workout 4 or 5 days. If I know I’m not going to find time during the day to workout and I really want to get it in, I set my alarm for 5:00 and do my elliptical or a workout video before the kids are awake. Even if you can only do 20 minutes of exercise or go for a walk with the baby, that is better than nothing. When my kids were infants I would put them in the swing or bouncy chair and do a workout video in front of them. They enjoyed watching me jump around the room. Usually though they would fall asleep. As they’ve gotten older, I put on cartoons and I do the elliptical while they are next to me. They would be watching them any way, so I might as well make use of the time. Get them involved. My kids like to “exercise” with me. They try to do jumping jacks and push-ups and follow along, just like in my “When All Else Fails” video. If you still have a napper, do your exercise as soon as they are asleep and check it off the list. Otherwise you’ll find other things to do and you’ll miss your chance. If you can’t get an hour or even half an hour all at once, split it up. 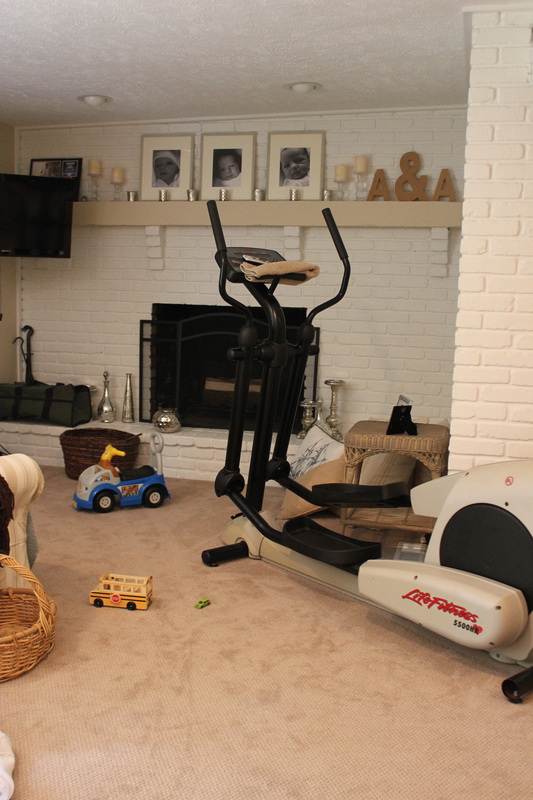 Do 20 minutes on the elliptical before the kids are up. Do the other 20 minutes during the baby’s nap. If you don’t fit in your workout, at least try to eat well. Skip dessert or wine with dinner. I will share my eating plans soon. Keep things in perspective. Some days it’s just not going to happen. There’s always tomorrow. Here’s to a new back to school routine! Usually by this time of the year, I have already begun pulling the annuals out of my pots and cutting back all of my hostas and other perennials, because normally they are all, well, DEAD or completely demolished by slugs. I typically also get the itch to buy mums by Labor Day. But this year, everything still looks so beautiful that I’ve been happy to put off beginning my fall yard chores. The cool, wet summer has made my garden, and the honey bees, very happy. 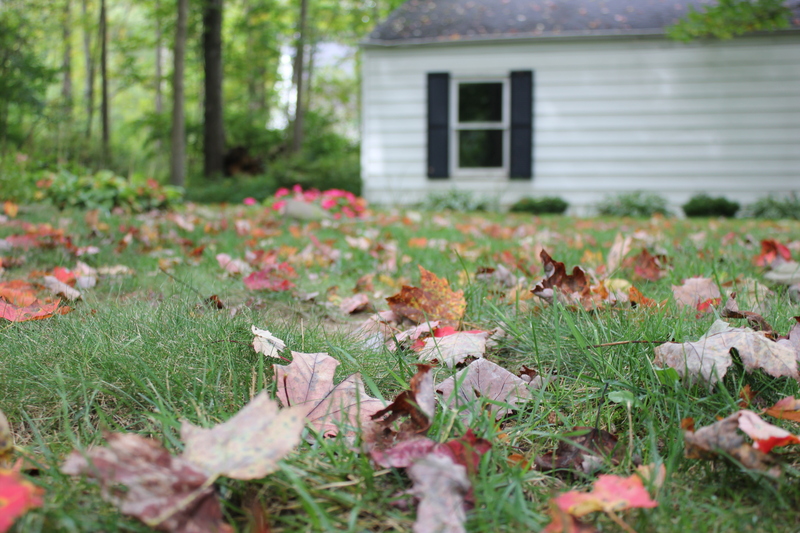 Here are some recent photos of the beautiful colors still lingering in our yard. The Endless Summer Hydrangea were apparently aptly named. Nonetheless, here in Ohio, the temperatures are quickly beginning to cool, and all of the sudden this week some of the leaves are starting to fall. So, I know I’d better start to begin thinking about my fall to-dos. Here are some of the jobs that autumn brings at our house. I will discuss each of these in more detail in separate posts as I complete these tasks in my own yard providing you with tips and tricks to be quick and effective and to get your children involved. ___ Store patio and porch furniture. Put away bird bath. Well, now that I’ve got all of these chores on my mind, I guess I should go outside and accomplish something. Stay tuned! We are all busy people on the run. We are all trying to fit in our fun. One thing that brings me joy is running itself, for exercise. But there is frequently something that causes my run or any workout to fall out of the top position on our family’s priority list. I know it is the same for you. Whether it’s because you had to work late, or your baby girl is home sick, or all your kids are all still not in school, or you can’t go to your favorite class because they don’t have childcare, or you don’t have a gym because it’s too expensive or it’s pouring when you wanted to run, or there is preschool pick-up and dance class and laundry, or the power is out… there is always something in life that leaves us with very little time to exercise. I was reminded of this the other day when my middle daughter woke up complaining of a sore throat, which we later learned was Strep. I felt terribly sad for my baby girl that she was sick, but I was also, frankly, secretly pissed, because Tuesday morning is supposed to be “mommy time,” when all the kids are away for an entire three hours. And this was to be the first full week of our new “back to school” routine. One that I had waited patiently for after a summer full of lots of activities from the top of my kids’ priority list. 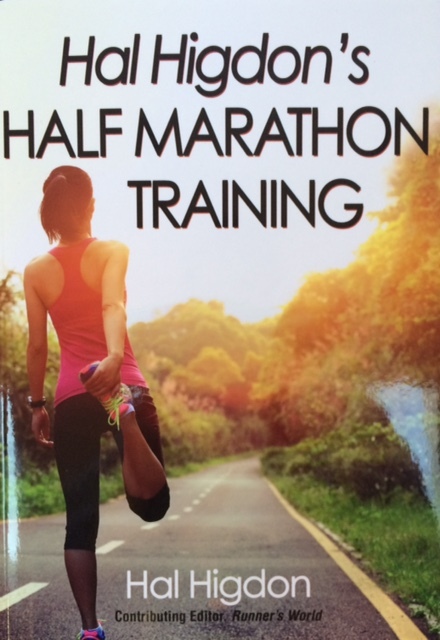 That first “mommy morning” I was super excited to go for a nice long run to prepare for my upcoming half-marathon and then write a post to share with you my half-marathon training schedule for new runners. I had already written the lead in my head. “Now that the kids are finally all back in school, it’s a great time to get into a new running routine.” Or something like that. But all of this went by the wayside, of course, because indeed, all of my kids were not finally back in school. While not an important problem in the scheme of things, the irony of this turn of events, seemed uncanny, as if it had been scripted. Was it a coincidence? Maybe. Karma? Perhaps. Or maybe it was a message from above reminding me that I am not in charge. A sort of tap on the shoulder helping me to remember to keep things in perspective. A whisper to make sure I’m keeping my priorities straight. Lately, I have been increasingly aware of God’s presence in my life and I’m fairly certain that this little tiny nudge was his work. After I was done pouting and being selfish, I realized that this coincidence had presented me with the perfect opportunity to share with you a great little workout I created awhile back to use on days exactly like this one. These are all moves you’ve seen and done before, but I’ve combined them into a quick ten minute rotation that you can do once or twice or three or four times depending on how much time you have. Even on a busy day, I’m pretty sure every one can find 10 minutes. The thing is, once you’ve done 10, you’ve built up your momentum and will want to do it again, and then again. Even if you have to do 10 minutes now, then take a break to change a diaper, give the baby a bottle, or get the kids a snack, it is easy to come back later and do another 10 minute set. I’ve always hated putting in a forty minute workout tape, feeling nervous that I wouldn’t get through all of it without the kids imploding. Then I’d feel guilty I didn’t get to finish it. This workout routine takes out the guilt. Don’t get ahead of yourself. Just commit to ten minutes at a time. Now, I’ve done dozens of different workout videos that claim to be a good workout in 20 or 30 minutes. When I’m done, I usually have barely broken a sweat. I do enjoy the Insanity and P90X tapes, but I can’t commit to doing a video tape every day. I’d get bored. 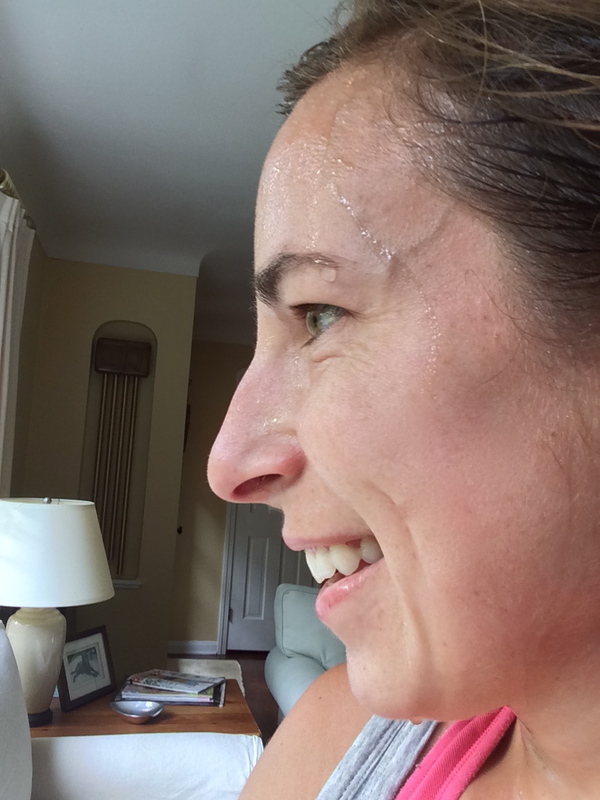 What I love about my “When All Else Fails” workout is that after 30 minutes, I am literally dripping sweat from my forehead, off my nose and chin down my chest and back. And my ponytail is completely soaked. 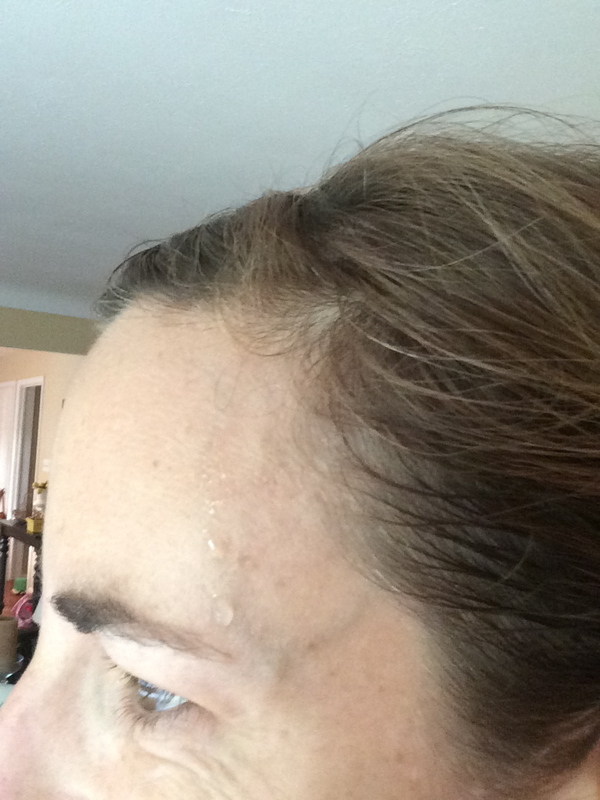 That is how I judge a good workout, by whether or not my pony tail is dripping wet. Yesterday, I was about as sweaty as I am after a good 30 minutes on the elliptical or maybe even after a 30 minute run. Based on my estimation, each 10 minute set will burn at least 100 to 150 calories. If you repeat it, you’re burning a good 300 to 450 calories. For a day when you thought you might not get in a workout, that’s great! 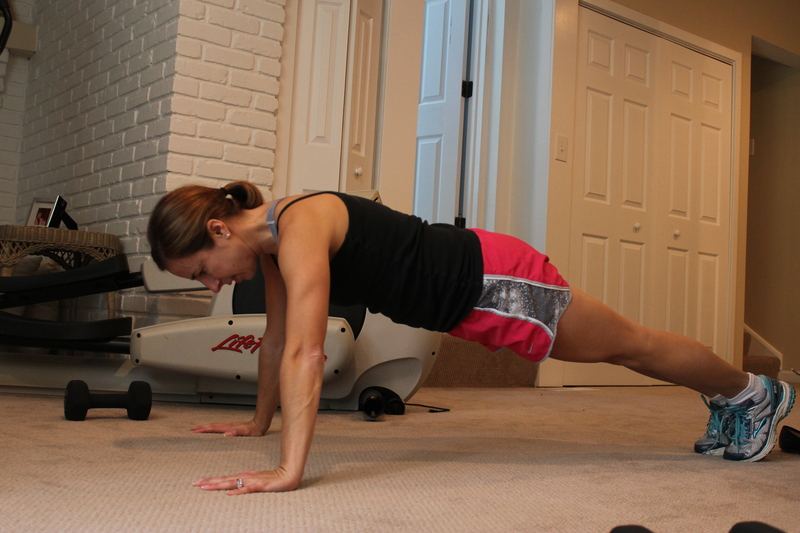 Not to mention, I was sore all over today from doing this yesterday, so you’re working lots of muscle groups too. After one, ten-minute set. Note beads of sweat. After second, ten-minute set. Sweat dripping down face, nose, and chest. After third, ten-minute set. Sweaty beast. Here’s the workout. Watch the video at the bottom of the page to see how to do each move (most are self-explanatory). It is ridiculous that I filmed it. What a loser. I give you permission to laugh at me. Do each of the following 10 exercises for 1 minute each. I time it by using the stopwatch on my phone, looking down at it occasionally to know when to switch to the next exercise. Take a one or two minute break for water. Then repeat, one, two, even three or more times. Burn 100 calories or more for each 10 minutes. I wanted to show you images of each exercise, but I didn’t have anyone here other than Caroline and John to take photos of me doing it. Here’s the photo Caroline took. Not too helpful. So, I decided to record a video of it so you can ensure you are doing the right moves. Want a laugh? Watch this video of one 10 minute set that I recorded with Caroline’s help. She is the star! I watched it back and laughed harder than I have in a long time. It is really quite fun and it is all so US. This is truly, honestly how I fit in a workout when all else fails. I hope it will help you some day when you can’t find any other way to get in a quick, yet effective workout. Not to mention, that your children might just want to join in for some exercise too. Please Note: You should consult your doctor before doing any exercise routine. 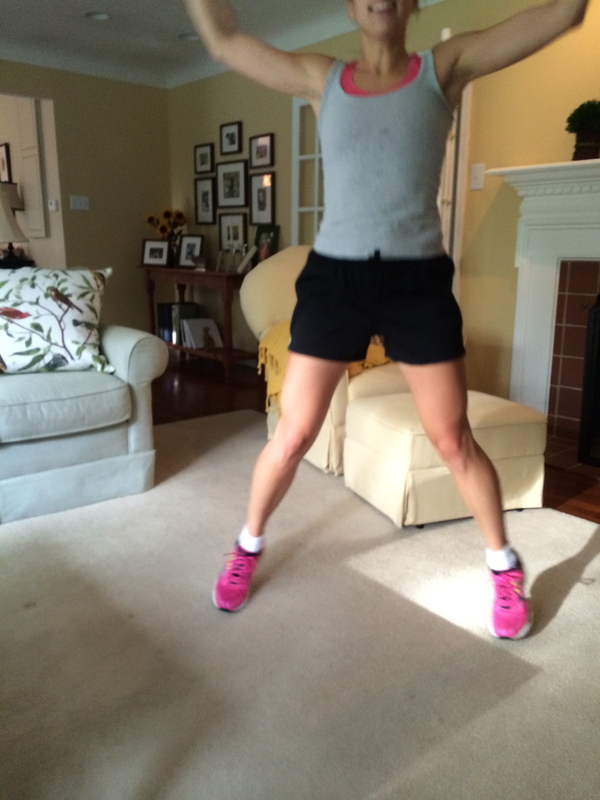 I am not a trainer or an expert, just a regular mom showing you my own workout. My husband and his father manage a wholesale produce distributor in the Cleveland Produce Terminal. Soon, I will tell you more about their company’s interesting century-old history. For today I want to share with you these gorgeous mangos he brought home for us. My girls actually place orders with him for various fruits and vegetables from his market. Mangos are always near the top of their list, and mine. I wanted to devour them the minute they came through my door, but I’ve learned with mangos that it is important to wait until just the right moment to cut into them, or else you’ll regret it. If you cut it too soon, the mango will be sour and hard. If you wait even just a day too long, it will be mushy and stringy. I was watching these mangos like a hawk, giving them each a gentle little squeeze every time I walked by the fruit bowl on the counter, my mouth watering in anticipation. This morning, they were finally ready! 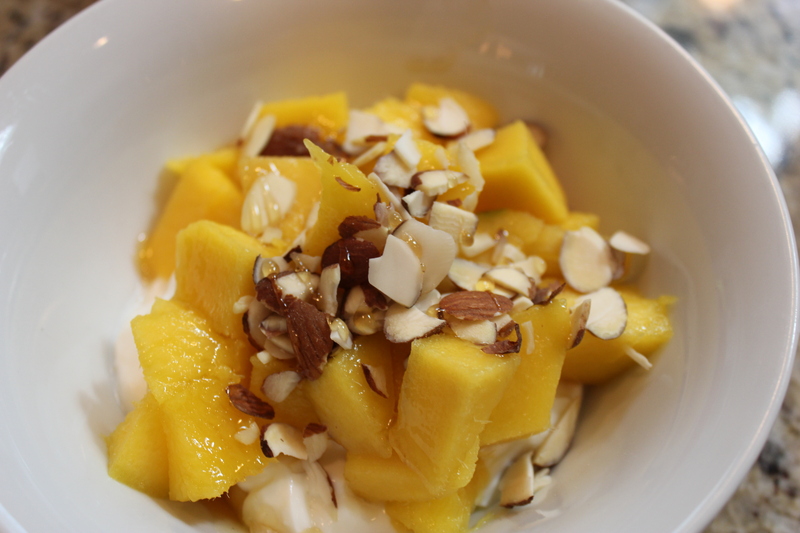 Today I used the mango to make a yogurt parfait that is perfect for breakfast, an afternoon snack or even for dessert. With 18 grams of protein, 4 grams of fiber and only 225 calories, it packs a punch. Keep reading for my recipe. It’s so simple, I’m not even sure I can call it that. First, let’s go back to the basics and let me share what I’ve learned about mangos from being married to a man who buys and sells truckloads of them for a living. I’ve also done a little research to satisfy my curiosity about one of our favorite fruits. Mangos are grown on trees in tropical climates. In the Unites States, they are only able to grow in the very southern parts of California and Florida. Therefore, the mangos found in U.S. stores are grown primarily in Mexico, Brazil, Guatemala and Peru. The fruit is harvested by hand. Fortunately for us, these countries harvest their mango crops at different times of the year, which means we get to enjoy mangos all year round. The mango year has two seasons, one in the spring/summer and one in the fall/winter. The two seasons overlap to provide a year-round supply. I like to eat local produce whenever possible, so I can’t help but wonder about the environmental consequences of eating fruits that have to be transported from far away places. According to the National Mango Board, researchers studying both the greenhouse gas emissions and the carbon uptake (sequestration) of a typical mango tree, found that the average mango tree could sequester up to seven times the carbon that is emitted during growing, harvesting and transportation to the U.S. retailer. That means you can enjoy that delicious, nutritious mango guilt free. Hallelujah! Most mangos in the grocery store will be hard as rocks. That’s ok if you don’t plan to use them the same day you buy them. If they are hard, they will typically need at least a few days at room temperature before they are ripe. If a mango you pick up in the store has any “give” when squeezed, do not purchase it unless you plan to use it the same day or maybe the day after. A mango’s color is not a sign of ripeness but has to do with how much sun each particular fruit receives on the tree. In certain varieties, the mangos that receive the most sunlight will develop a red blush at the stem end. This red blush is not an indicator of maturity, quality or ripeness. 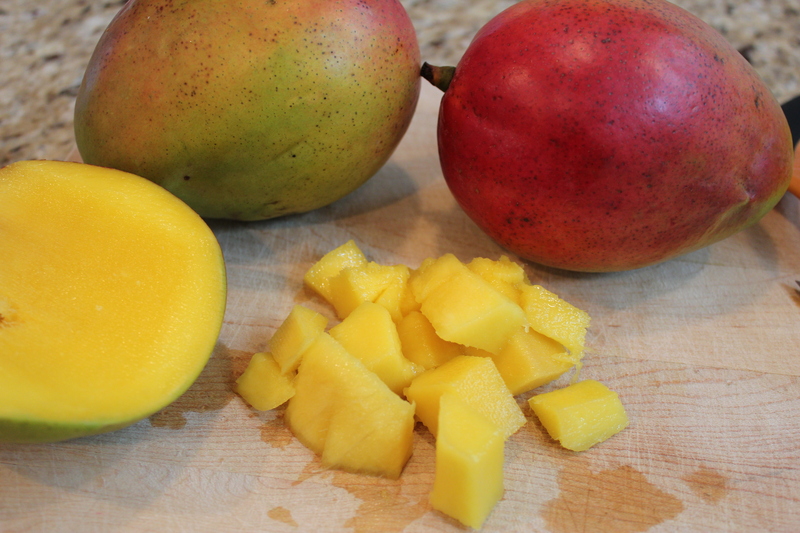 If the mango is still hard or very firm, place it on your counter to ripen. Do not place an unripe mango in the refrigerator. Give it a gentle squeeze once a day… or several times a day if you can’t wait to eat it like me. A perfectly ripe mango will give just the slightest bit. If you are able to feel your fingers squish into it (that is a technical term), it may already be over-ripe. Cut it up and eat it immediately. Or I sometimes cut up an over-ripe mango and freeze it to eat as dessert, to put in smoothies or to top ice cream or yogurt. Frozen mango makes for a great craving decoy. 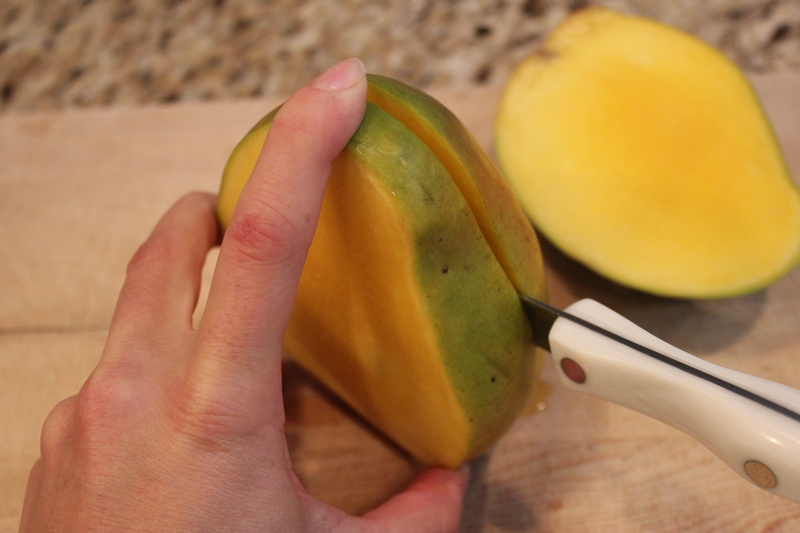 To properly cut a mango, turn it upside down, with the stem touching the cutting board. If you envision the mango in three vertical sections, the seed or “stone” runs through the middle section rendering that portion virtually unusable. Cutting straight down (right or left of center) you will cut off the two outer sections, sometimes called the “cheeks”. Throw the center section away (or on your compost pile.) 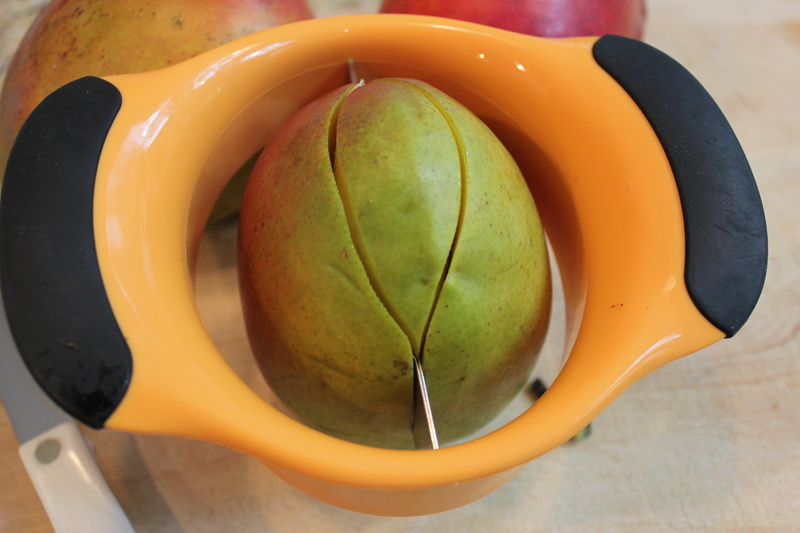 These days, you can also buy a mango cutter. While this tool can cut in a curved shape to get closer to the stone giving you more fruit to eat, I have found that sometimes it also cuts part of the stone off with it. I typically use a good old-fashioned knife so I have more control. Once you have removed the stone, taking one cheek at a time, you can dice the mango right inside the skin which makes for easy clean up. I hold the mango in the palm of my hand while I do this. With the tip of your knife, first cut a few vertical lines straight up and down without cutting through the skin. Then cut a few horizontal lines across. 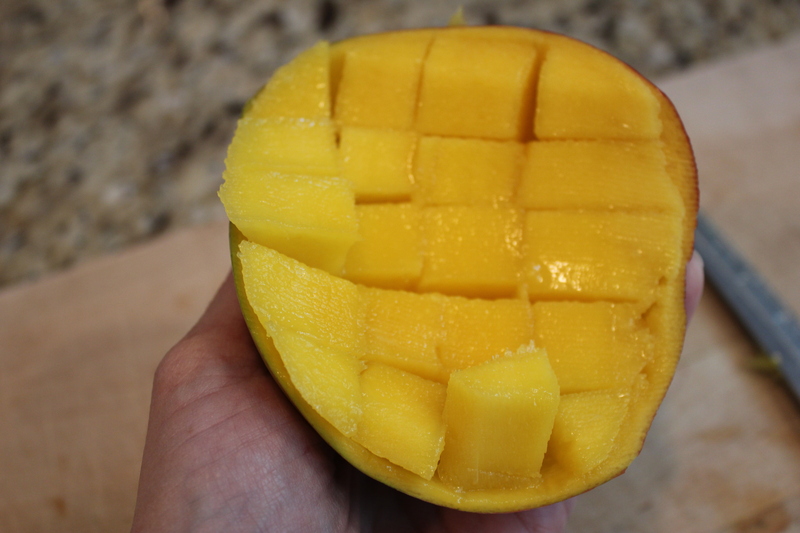 Then run your knife all around the outside of the flesh and then underneath the squares of mango. You can the dump the mango right into your dish. A cup of mango provides 100 percent of a day’s vitamin C, one-third of a day’s vitamin A, a decent dose of blood-pressure lowering potassium and 3 grams of fiber. According to the Center for Science in the Public Interest, it is also one of the fruits least likely to have pesticide residues. Here’s the yummy parfait I made for breakfast. Well, then it actually turned into John’s breakfast. He swiped it after I had just a few bites. 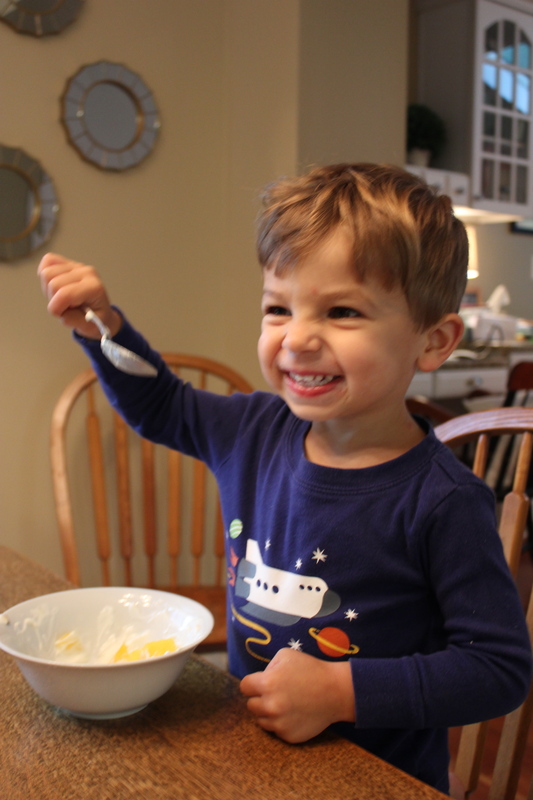 He virtually licked the bowl clean. While I was disappointed I didn’t get to eat it all up myself, I am happy my boy likes to eat such nutritious food. One 5 to 6 oz. container of nonfat, plain, unsweetened Greek yogurt. I use Stonyfield Organic Nonfat Greek. Andy likes Fage 0% Plain Greek. Place yogurt in bowl. Top with diced mango. Sprinkle with almonds and drizzle with honey. Here are the Nutritional Facts for those of you counting calories. I track what I eat with the My Fitness Pal app. It is free and it is an invaluable tool that was key in helping me lose weight after having John and for maintaining my weight today. Not going to lie, it is a constant battle. Visit http://www.mango.org for more information about mangos. A very dear friend of mine is expecting her first baby next spring. 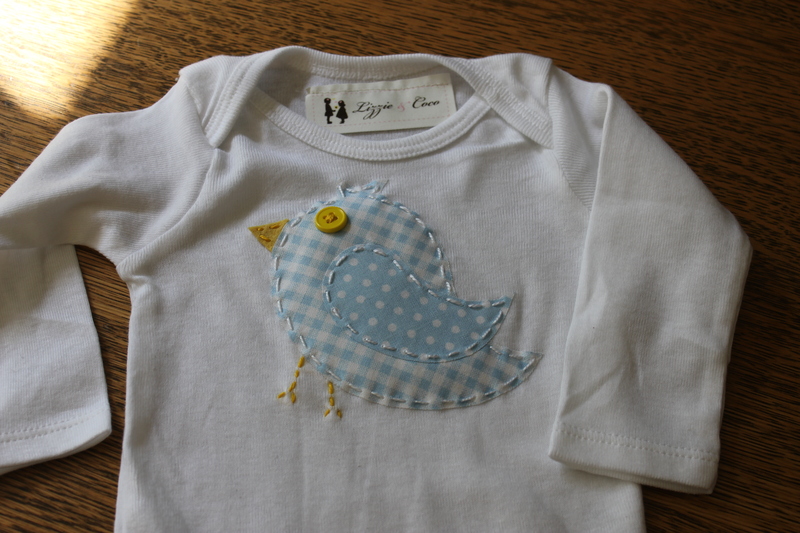 I am always so excited when I am in need of a baby gift as it gives me an excuse to make the time to fit in some sewing. Plus, I don’t have little tiny babies of my own to make cute little clothing for any more, so it allows me to have some fun and get my creative juices flowing. I taught myself how to appliqué when I was expecting my third child just a few years ago. I actually was never into crafting until then. It all started when I was in a store looking for some clothing for my girls and I saw a cute felt flower hair barrette. The practical, bargain shopping, wanna-be artist in me thought, “This would be super easy to make.” So, I gave it a try and was pleased to discover that it was quite simple and also surprisingly enjoyable. To my husband’s dismay, there was soon a rainbow of felt rectangles and thread floating from kitchen counter to coffee table in our house. I started thinking of different shapes I could make with the felt and new ways I could utilize it other than just for barrettes. I tried creating a shirt by sewing a felt elephant to a store-bought white Gerber Onesie. After a few failures, I did my homework and was able to figure out how to improve my technique. My creative side took over and soon I had lots of shirts for baby girls (and no baby girl to put in them). I wrapped some up as baby gifts and my new found love of crafting began to take on a life of it’s own. Soon I found myself writing a business plan, creating a logo , building an online store and after many late nights and early mornings at work, I was selling my shirts and barrettes in local stores. I was expecting a baby boy of my own that year and to make things interesting, I was the ONLY one who knew it was a boy. My husband didn’t want to know the baby’s gender, so for the first time in all three of our pregnancies, I found out and I had to keep it a secret from everyone so as not to spoil the surprise for my husband. The joy we both experienced on May 15, 2012 was one of the most spectacular moments of our lives. 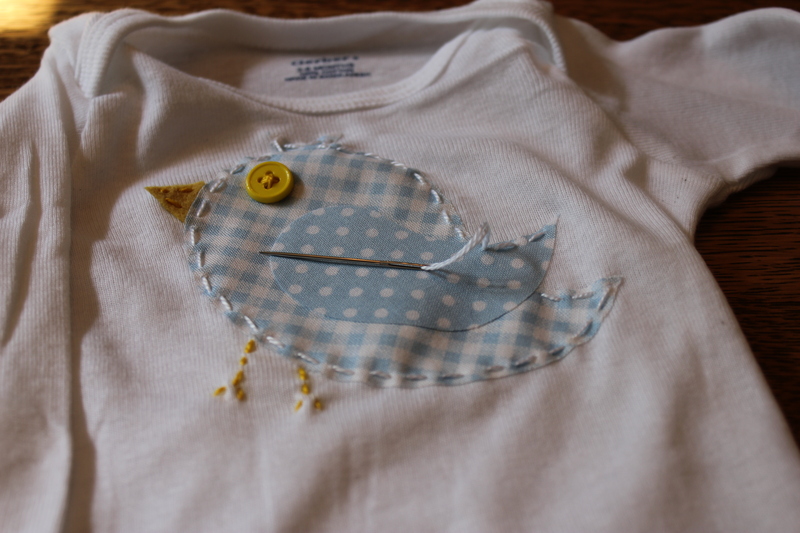 So, enough about me, here’s what you’ll need to make an adorable bird appliqué baby shirt. A shirt in your size of choice. Here I used a 3 to 6 month white Gerber Onesie. Two small pieces of your choice of fabrics for the bird’s body and wing. 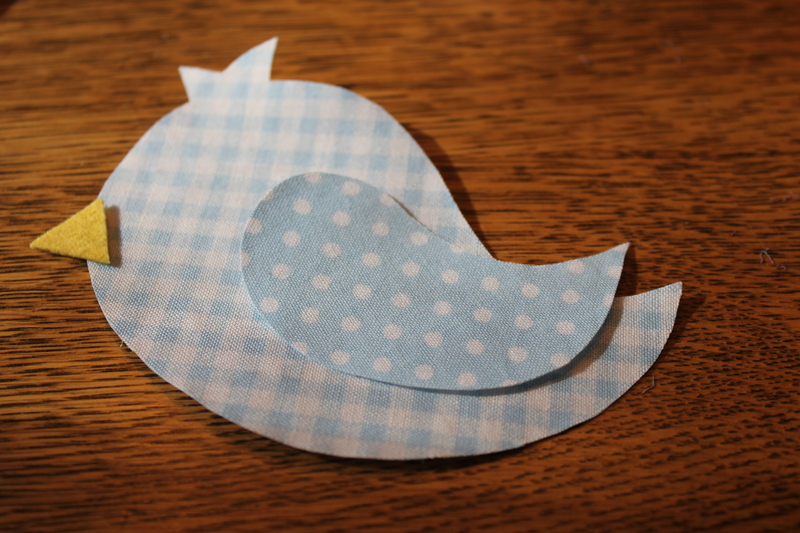 I chose a light blue gingham and a polka dot fabric. One very small piece of felt or other fabric for the birds beak. A button for the bird’s eye. 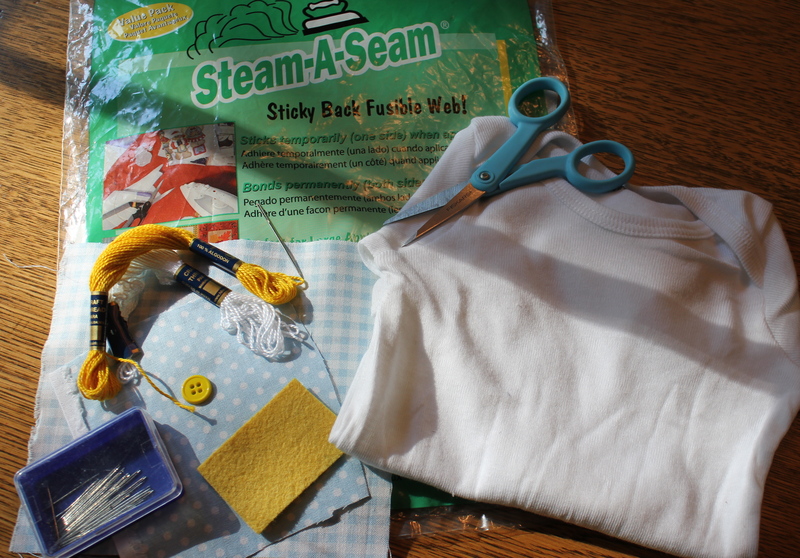 Steam-A-Seam Fusible Web – you can find this at your local craft store. Joann Fabrics carries it, but I don’t believe Michael’s does. Small cutting scissors that allow you to cleanly cut around tight corners. I love my blue Fiskars craft scissors for this project. Cut out two rectangles of Steam-A-Seam (SAS), about 5 or 6 inches square. One side of the SAS is paper and the other has a bumpy texture which, when ironed, melts and permanently sticks to fabric. You can place the SAS on the baby shirt to see about how big of a piece you need depending on how large you want the appliqué to be. Next, on the PAPER side of one piece of the SAS, you will sketch the silhouette of a bird. On the second piece of SAS, sketch the shape of it’s wing. 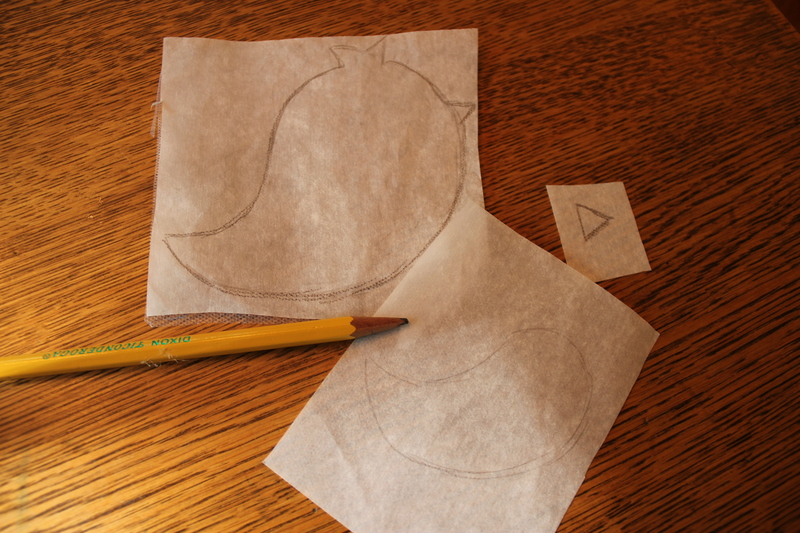 On the small piece of SAS, sketch a small triangle for the beak. I draw all of my designs free-hand, so I don’t have a pattern with perfect edges to give you. Just do your best and be creative. “There is no right or wrong, when you’re making art. Having lots of fun, is the most important part.” – Mickey Mouse. If you haven’t already, give your fabrics a quick iron. It will make for a prettier finished product. 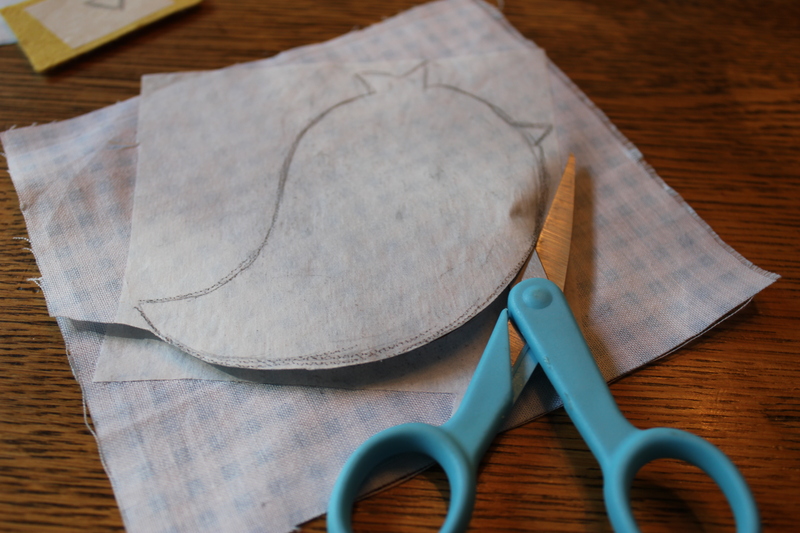 Then, place the fabric you want to use for the bird’s body GOOD SIDE DOWN. 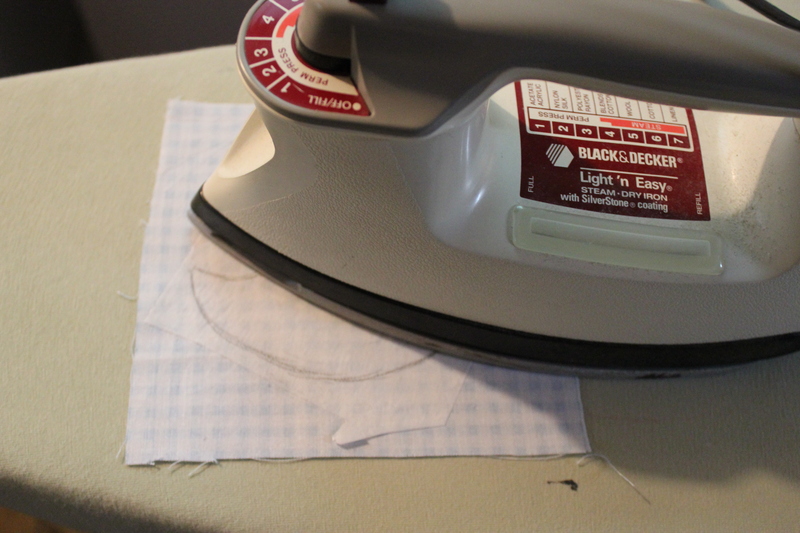 It is very important you iron onto the BACK of your fabric. 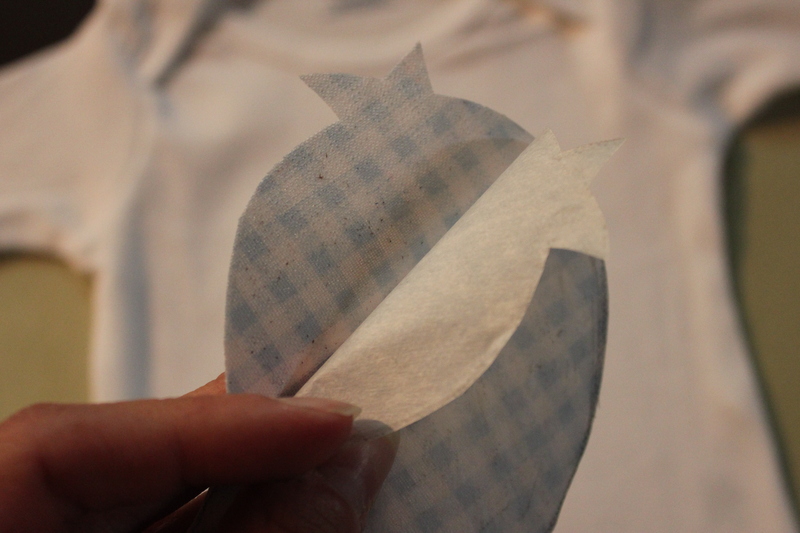 Place the SAS with the drawing of the bird up and the bumpy, glue side touching the fabric. Iron over the SAS, fusing the paper to the back of the fabric. Do the same for the wing and the beak. Next you will cut out the shapes. Now, you will peel away the paper backing on each of your shapes and place the fabric shapes how you like them on the shirt. Next, iron them down. Next, you will sew on a button for the eye, and a few stitches for each leg. Then, I like to stitch around the border of the appliqué by hand. The stitches are not totally necessary as the Steam-A-Seam should stay in place without sewing down the edges, but I feel it makes it all look more finished. You could also do this with a machine, but I prefer the look of the larger stitches for a children’s piece. I did not include a picture of it, but I almost always iron a square of interfacing web to the inside of shirt, behind the appliqué. You can find this at your local fabric store. It is a soft white fabric with a light glue on one side. It holds all the threads on the back of your appliqué in place to keep them safe for machine washing. Most importantly, it makes for a soft smooth surface against baby’s skin. 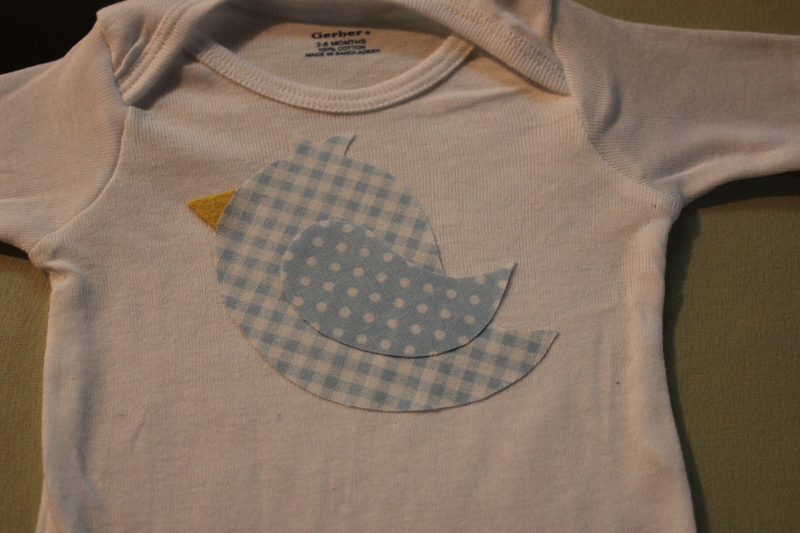 In just about an hour, you’ll have a super cute, unique shirt for your own baby or to give as a special, handmade gift. I’m excited to give this one to my dear friend.